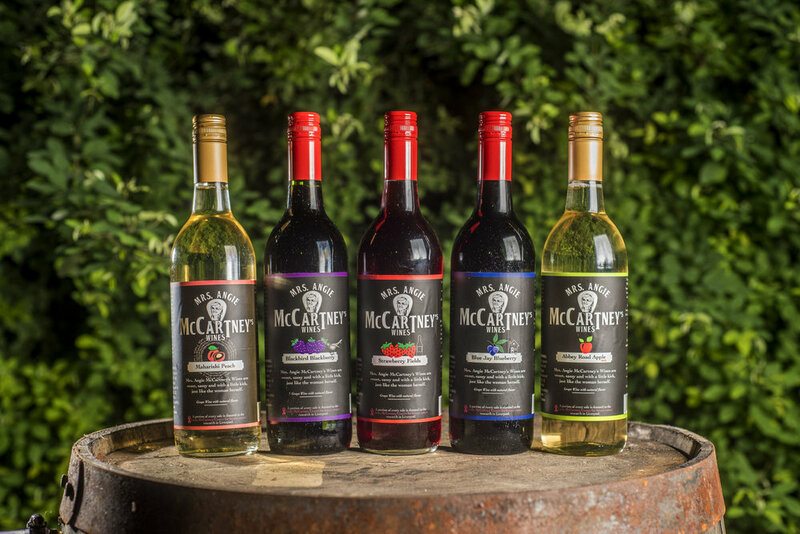 Mrs. McCartney's award-winning Wines are sweet & sassy, just like Angie herself. Made with wine grapes from Napa and Sonoma in California and blended with peaches, apples, blueberries, blackberries and strawberries from rural Texas by Clear Creek Winery in Kemah, these flavors are ideal with brunch, high tea, after dinner as a dessert wine or even as an ingredient in your favorite cocktail. Dr. Angie McCartney - a Brit born in the year of the Wall Street Crash - 1929, is known to be fond of her cuppa tea in the mornings, and a little tipple of vino at the end of her entrepreneurial days. 10% of the profits of this product are donated to The Linda McCartney Centre for Breast Cancer Research in Angie's home town of Liverpool, UK. Now Angie's saying "bottoms up" to you and yours! Click to read more about atomic Ange! Click here for wine cocktail recipe inspirations.